I thought the only way I'd get emotional today is if the Bruins were to lose tonight, but that went out the window after I read this Players Tribune piece Nate Solder wrote. As many players do when they leave a team they played for for many years, Solder thanked New England for taking a chance on him. But it went much deeper than that. He also thanked New England for taking care of his family while his young son Hudson was battling cancer. Hudson was diagnosed with cancer in October 2015 while Nate was on IR with a torn bicep. Not many people knew right away, but Josh McDaniels and Bill Belichick who Nate said he grew closer with as a result of this, were there. I started singing the lyrics, and I just broke down. I started bawling. Then Lexi did, too. The two of us were doubled over on our knees, sobbing — no … wailing throughout the entire song, and everybody was looking at us, wondering what was wrong. They didn’t know. I had spoken to him and Coach Belichick when Hudson was first diagnosed. So not only did Josh know what Lexi and I were going through, but standing there next to us with his four children, I think he really connected with us and understood the pain we must have been feeling. He also recalled a conversation he had with the both of them after that Sunday. “Nate, what you’re going through with Hudson … that’s more important than football.” He told me that if I ever needed to dip out of a meeting because the stress got to be too much, nobody would ask any questions. Coach Belichick told me the same. He said that if I ever needed to miss practice or a meeting, it was totally fine. Belichick takes a ton of heat for rarely showing any emotion, but Nate does a great job highlighting how compassionate Belichick was towards him and the situation. That compassion extended to the top of the organization as well. Hudson would regularly go in on Tuesday's for treatment. During one winter, ahead of an impending snow storm, Robert Kraft put the family up in a hotel right next to Boston Children's Hospital because they were afraid they would miss treatment if they stayed home. 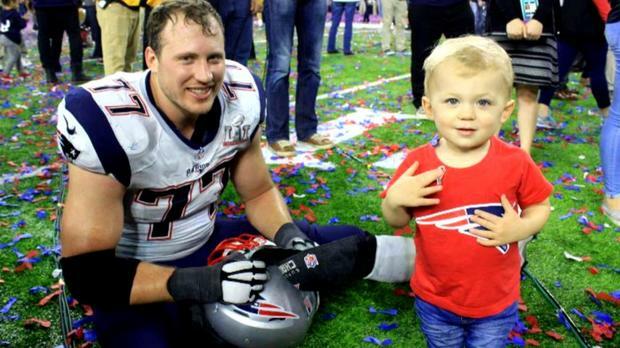 When the Patriots beat the Falcons in Super Bowl LI, Nate said the first thing that came to his mind was his son. That was the year that we played the Falcons in the Super Bowl. And after that game, that was the first time that I think my heart shifted from fear and guilt and anxiety … to hope. Winning used to be everything to me. But in that moment — being on the field with my teammates and my family after winning the craziest Super Bowl ever — the game and the fact that we had just won our second championship in three seasons wasn’t even at the top of my mind. I remember looking at him playing on the field and kicking confetti around, and I was just thankful that he was O.K. His health was everything. Winning the Super Bowl was icing on the cake. Nate goes on to say his decision to play for the Giants was based heavily on the kind of medical care Hudson, who is still battling cancer, could get. There's not a single person on the planet who would blame Nate for doing that. Hopefully Hudson will get the care he needs and will beat cancer for good.